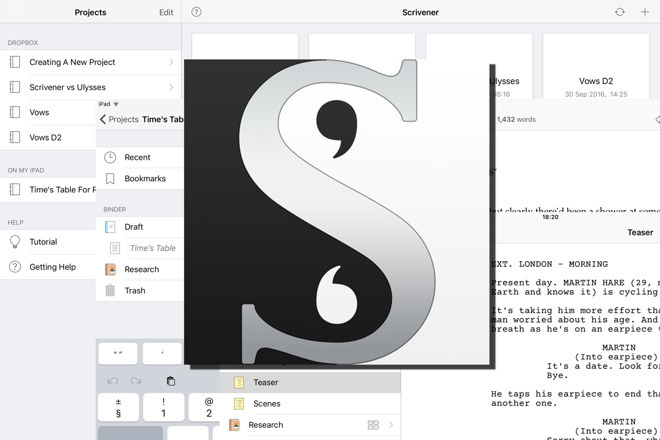 Scrivener is a writing studio, or writing environment, rather than being a word processor. It focuses equally on getting words written down and on how you handle those words later. So it's just as much about organizing, changing, redrafting as it is about how you send your work to the outside world. The new 1.01 version is an update to the iPad and iPhone edition, and they bring small but distinct improvements to the app. Scrivener 1.0 was a quite remarkable first release of a serious, heavyweight app, but of course it was based on years of work —Scrivener for Mac and Windows has been popular among book writers for close to a decade. Then, Scrivener for iPad was promised for what felt much the same amount of time. Its arrival over the summer was anticipated and welcome. The fact that it's taken five months for even a .01 update is a tribute to how strong and robust the 1.0 release was. Depending on the type of writing you do, the most significant new improvement is the addition of superscript and subscript support. There are also more options for different types of pre-generated templates, and search now finds text in labels or tags, as well as in your text. For Markdown users, and there are a few, there is better formatting and printing control. Unlike its rival Ulysses, though, Scrivener does not expect you to use Markdown. If you do, and if you like this method of formatting text, then it's well supported. If you don't like it or have never heard of Markdown, you just write in Scrivener exactly as you would in Word or Pages. Scrivener and Ulysses occupy so similar a place in the market that whichever one first interests you, you should look at the other too. You may well end up buying and using both. A quick, crude and hotly debatable summary of the difference, though, would be this: Ulysses is best when you are writing very many short pieces of work; Scrivener is best when you're doing one long piece such as a novel or non-fiction book. Scrivener also includes a scriptwriting mode, though. It's cleverly implemented and writing a script in Scrivener is fast and pleasurable. Only, the makers suggest using it for just your initial draft of a script before exporting to a specific screenwriting tool like Final Draft. In practice, though, Scrivener for iOS is more reliable than Final Draft on this platform —many times we found that Final Draft would crash on importing Scrivener scripts. The fault could be on either side or both but we've found Final Draft for iOS to be generally poor compared to its main Mac and Windows desktop version anyway. 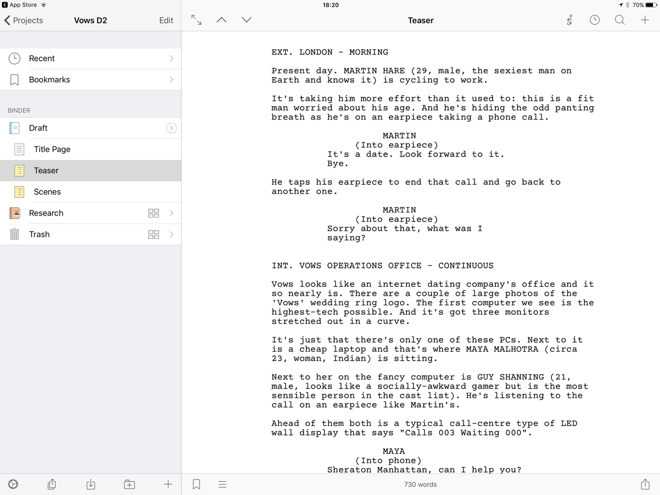 So in theory you're better off writing scripts in Scrivener for iOS. However, in practice, you throw away some of the app's strengths when you do. Scrivener works very, very well when you divide your writing project into small chunks such as chapters or scenes. You can choose to focus on just the one you're writing, for instance, or you can look at the whole picture. Choose to read chapters 17 and 29 next to each other to see how a character is developing. Write a prologue and then when you realize that nobody likes prologues, you can drag it to the middle of the book instead. Equally useful, notes can be written and assigned to each of these small sections, while labels are available for quick tagging. So you can say chapter 7 is finished and ready to send to your editor while chapter 31 is garbage. This can all be accomplished with the scriptwriting mode, too, if a screenplay is divided into scenes kept in separate sections called screenings. In practice, you never will. As you write, the very speed of how Scrivener helps you semi-automate writing scene headings and character names mean that you will just write the entire screenplay in one go. Consequently, as genuinely enjoyable as it is to write scenes and dialogue in Scrivener knowing that it is handling the formatting, the app's strengths are in book writing. No publishers or editors that we've spoken to or worked with use Scrivener or Ulysses, but we're sure that there are exceptions. These apps are for writers and the people you need to send your work to are occasionally using Adobe InDesign, much more often Microsoft Word. Because of the predominance of Adobe and Microsoft solutions, Scrivener has strong support for exporting to different formats. You can write in Scrivener but have your work exported to Word so well that nobody will ever know. Scrivener for Mac and Windows have more options for this than the human brain can comfortably comprehend. The iOS version, though, is radically stripped down —it's doubtlessly less powerful but its far simpler controls still include most of the features that most writers will need most of the time. For the moment, Scrivener for iOS is superior to the Mac and Windows desktop versions. The next version of Scrivener for Mac and PC will include some combination of the power and the new design. However, Scrivener 3.0 for Mac was promised for the summer and in fact shortly after the new iOS edition. As yet, there is no sign of it. That shouldn't stop you from buying both. If how Scrivener works is compatible with how you work, you're going to become a devotee over other options, and whichever version you buy, you will soon buy the other one too. The advantage right now is in how Scrivener —at last —does what Ulysses has for some time in allowing writers to work anywhere. 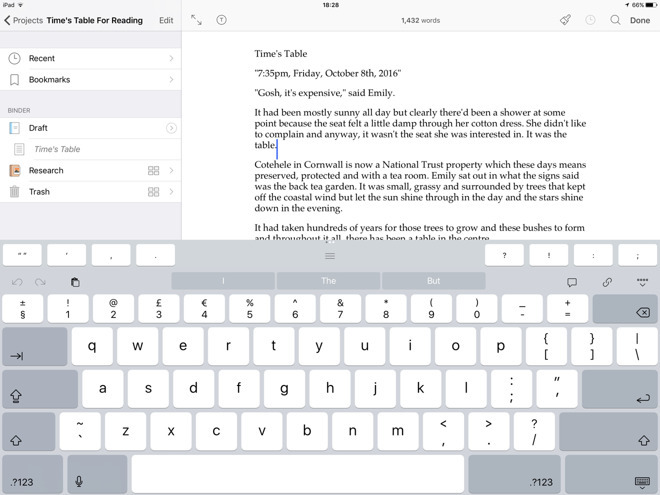 The iPad, and now the iPhone, are such useful tools for writers that having the same software on both is more than a boon, it's become effectively mandatory. What's certainly mandatory when one has both Mac and iOS versions is that content goes between them automatically. Ulysses has this covered with iCloud support but is weak on anything but text. Scrivener is much stronger on including images and PDFs or any research materials into the same document with written words. However, it does not have automatic syncing over iCloud. It can't. As the Scrivener file format includes all manner of elements such as these research PDFs as well as text and graphics, it doesn't lend itself to iCloud's comparatively simple syncing. Also, Scrivener also runs on Windows which will never have realistic iCloud Drive support as part of the OS. Consequently, Scrivener requires you to use Dropbox. That does mean everything written on iPad is available on Mac or PC, and vice versa. However, it also means you have to manually tell it to sync. The Scrivener for iOS app is generally very good at prompting syncs and it does much to automate it. Often, though, we would find that it just didn't prompt us for some reason. It was only occasionally, but it was enough that we grew a reflex action of just tapping Sync whenever we drew breath. Also, if you're an existing Scrivener for Mac user then you could move all your work to Dropbox to make it available on the iPad. Don't fall to temptation! When you have one, two or perhaps three Scrivener books on the iPad then it syncing and loading works so quickly that you don't notice it. When you have more than that, you notice. 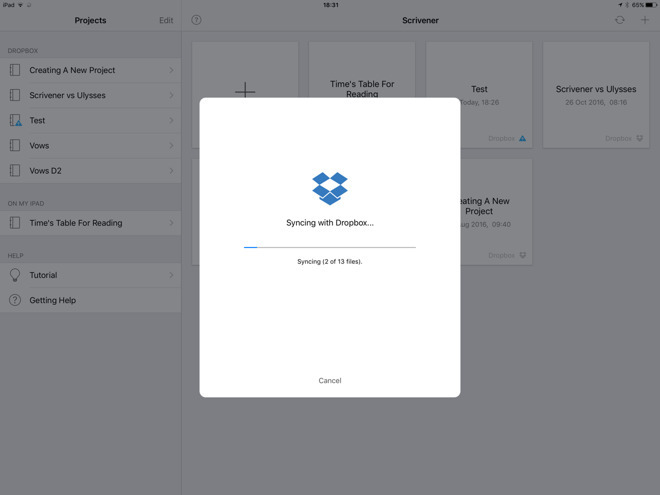 Once you get into the habit of solely moving your current book project into Dropbox, Scrivener is maybe the best writing app you can get for the iPad. 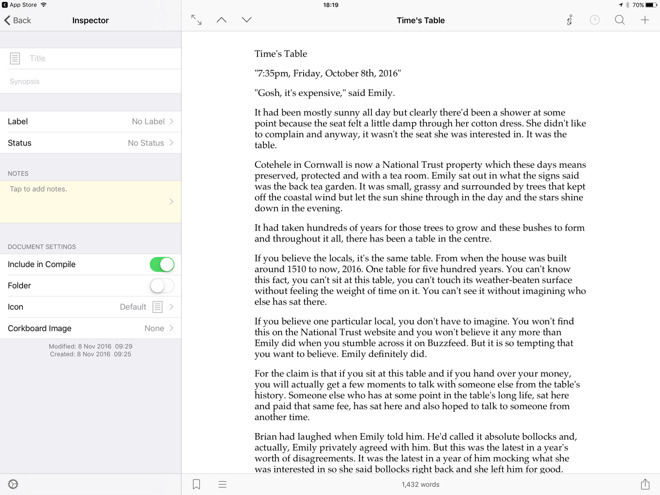 Scrivener 1.0.1 requires iOS 9.0 or higher and costs $19.99 on the App Store. Scrivener 2.8 for Mac requires OS X 10.6.6 or higher and costs $44.99 on the Mac App Store, and the same direct from the developer.